Aurora Thunderjet 4-lane factory sealed Stirling Moss race set #1308, dated 1963. I would guess that this set was actually sold in the mid 60's. It is in new, unused condition, still with the original factory clear cellophane seal unbroken, over the styrofoam insert. Make no mistake about it, TJet sealed sets are rare, and TJet sealed 4-lane sets are even rarer. On top of the seal is the Model Motoring Aurora checkered flags sticker, which usually got discarded with these sets. The cars in the set are a turquoise with black center stripe Porsche 904, a white with black stripes Cobra GT, a red with white stripe Dino Ferrari, and a yellow with red stripe Lola GT. Note that the factory seal has enough air space over the cars for them to flip over when the set is handled. I cannot guarantee that the cars won't flip during shipping of this set, I trust you will understand. The set consists of 4 tan thumb speed controllers, 6- 9" radius curves, 6- 6" radius curves, 10- 9" straights, 4- 6" straights, 2- 9" terminal tracks, 4 modular bridge beam supports, a service manual which has some cover staple rust with light corner and left side wear where the staples are but none of the pages are bent, and one DC-2 (22 Volt) powerpack. The box top itself is in fairly good condition, with some surface tears on the top side flap area as shown. None of the box corners are split, and there is some light brownish water mark damage at the upper left portion of the box top as shown. The two left corners have some wear marks as shown. Box bottom looks undamaged. The price on this set is not meant to put anyone off, it's just that hard for me to come by these, and this is the last one of the several I had from years ago. I just want to make it available here if any Aurora collectors have a serious interest in acquiring one. It's a very special piece. Aurora TJet 2-lane used Stirling Moss figure 8 set, set #1314, dated 1967. This set is a used complete set with everything in running condition. The box top is in nice shape with clean graphics, and the box edges and corners have fairly light wear. The box corners have been reinforced with clear tape in a neat manner. The cars in the set are an olive green '63 Corvette Stingray with cut rear wheel wells and missing the top half of the right window post, and missing the rear bumper tips. Front chrome shows medium wear, and screw posts are not cracked. The chassis has a soldered motor pinion gear and soldered electrical connections on the bottom. Wheels are painted silver, and silicone rear tires have been added for good traction. The second car is a white with black stripes '65 Mustang Fastback in fairly good condition. The body has had the black hood stripes removed. It has good wheel wells, medium chrome bumper wear, and the front screw post has been cracked about 1/16" down but holds the screw fine. The stock TJet chassis runs fine. + enough locks and joiners to complete the set. I believe the Stirling Moss race set #1308 you have for sale is in fact a repackaged set. As the original set did not come with the four cars that are included in your set. 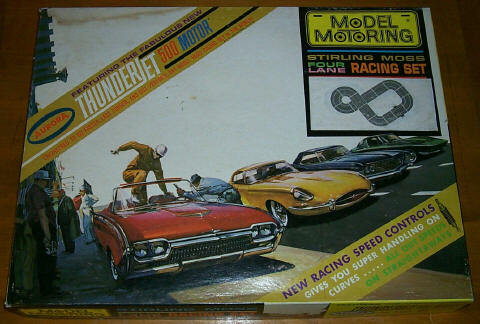 The original set included the four cars depicted on the box cover (a Ford Galaxie 500 convertible-yellow, a XKE Jaguar-green, a Ford Mustang hardtop-yellow/black top and a Corvette Stingray-blue). This set was released in Los Angeles in late Oct.-Nov. 1962. I was ten, and each weekend my father and mother woulld take me into either Santa Monica, downtown LA, Hollywood or Culver City to see a double feature and window shop at one of the five toy stores (not known as hobby stores in those days) I frequented. The only store at this time to carry Aurora MODEL motoring in this area was in downtown LA. This set sat in the front window of this store gathering my dreams and wows each trip downtown. However, that Christmas and my following birthday I asked Santa and my dad for Marx Army sets (D-DAY and IWO JIMA) instead of this racing set. Choices can be rough even for children. Still, I couldn't get this racing set out of my dreams and so I decided that I needed to earn more than my $2.50 chore allowance and thus convinced my parents to let me mow and edge three neighbors lawns per week for an additional $7.50 a week. When, I finally saved up enough money ($39+) in July to buy the set I was to receive an unexpected vote of confidence from my father that I was no longer a child. My parents although Indy and Grand Prix racing fans (the closed circuit viewing days) never had a car and neither my mother nor father drove (other than HO slots and later video games). When I had saved up enough money to purchase my dream I told my father how excited I was for the weekend to come, as my father worked from 4:30-12:00pm for Douglas Aircraft, so that we could go into downtown to make my purchase. My father told me if I was old enough to work for what I wanted he thought that I was now old enough to go into downtown LA by bus on my own to buy what I had worked for. I had just turned eleven and was stunned, excited, frightened-scared too here this declaration from my father; but off I went into my first steps towards manhood. First the 1/2 mile walk to the bus stop then the Culver City bus to the end of the line and then the LA Muni into downtown-1hr. and thirty minutes later I was ready to start my return trip home with dream in hand. I still have this race set, the box though long gone, the track now rusted due to both a garage flood and a storage closet leak, the cars, four steering wheel controls-not plungers, the manual and the rubber guard rails still intact and usable. Weekly, my father and I designing and building hundreds of layouts, timing and hopping up cars and shopping for track and car additions until the wee hours of Sunday morning. Imagine the surprise my father and mother presented me with for Xmas 64 a solid 9' long by 3' wide with 2' high rails and 2 12' long runners of track assembled and wrapped to resemble a toboggin. 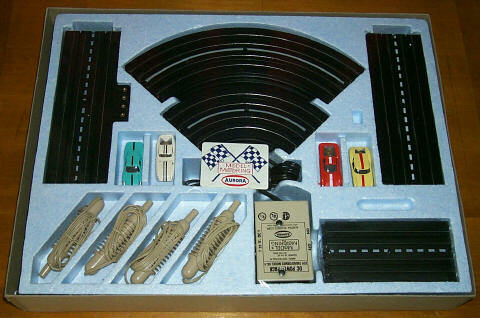 Almost $ 2,000. of track, at 1964 prices, that my parents happened upon at JC Penny's in Santa Monica loose for 5 cents a section. A steal at less than $200. Wtih my childhood friends we built upon this original set through elementary and both junior and senior high school adding cars, scenery and the adventure of building a neighborhood racing club. Whether stored in boxes or set up, rusty or new, through both forever marriages and jobs my race set has journeyed with me not as a item of sentimental value but as a dream realized of a life of shared love with my father and friends. In special regards of this memory, I relate the following in relation to the Cobra GT offered in your set. During the spring of 64 while I was struggling with junior high algebra and having turned 13 my dad asked to speak to me outside. Oh-oh! I thought that my dad must have gotten word of my alegbra grade. Once again my father surprised me saying, "I really am proud that you're my son." My father suddenly placing both his clenched hands behind his back asked me to choose either left or right. I chose his left which he opened to reveal a sight to this day that the memory alone brings back -WOW!!! In my dad's hand was the most beautiful thing I had ever seen- a blue Cobra GT. WOW!!! My dad then said, "this just came out and I wanted to get it for you. Oh, by the way, this is for you to as he opened his closed right hand to reveal an even more incredible sight - a yellow Ford GT 40!!! The low slinky lines and swept back rear windows were so unlike any of the early ho cars - finally real GT racing cars. I was so awe struck I couldn't even think to say thanks. The only thing I could think of to say was to ask my dad - WHY DAD? IT ISN'T MY BIRTHDAY OR CHRISTMAS! What my father replied with has stayed with me all my life as has these two treasured cars. My dad replied with his smile and said, "I LOVE YOU. AND FOR THE PEOPLE YOU LOVE IN YOUR LIFE YOU SHOULD TRY TO MAKE IT CHRISTMAS FOR THEM EVERYDAY." My father succumbed to cancer last summer after having enjoyed living a lifetime in accordance with this principle much to the benefit of the child in all of those he loved. One of my closest friends brought old but still WOW - yellow and blue - down from Sacramento so that I could illustrate for my father's eulogy the greatness of a small gift from a father to a son. In Memory Of All The HO SCALE Big Time Fun My Father And I Shared Starting With This Race Set. Wow, what a great look back on your father, growing up, and Aurora slot cars! It's a perfect example of how deeply ingrained Aurora Model Motoring was and is in the lives of so many of us. By some twist of fate perhaps, it comes on the 18th anniversary of my father's passing, and 4 days before the 2nd anniversary of my mother's passing as well. My mom and dad were divorced in '63 when I was not quite 4 years old, and my sister and I visited him twice a week at his apartment in Chicago. One day in '67 he got word from someone he worked with that a lot of boys were enjoying slot car racing, so he thought I might like it and told me about it...I had no knowledge of what slot cars were at that time. I remember him going to a hobby shop and talking to the owner, and he looked over the latest offerings from Aurora. He told me about what he saw, and when I said it sounded like fun, he decided to get us started, which would give my sister and I something to play with when we came over to visit. He mentioned that he was undecided as whether to get a complete set, or just to buy pieces of track and loose cars. Since he wanted to build us a layout in an original configuration on a 4x8 board, he decided to buy the loose pieces, so as not to have any wasted unused items. I raced on it for another year or so, but when AFX came out in '71, I knew I wanted to try that, and my mom bought me a an AFX set for Christmas. The cars were so well detailed and the chassis were faster, and soon I was tweaking and modifying the cars for hours and hours on end. I'd save up my allowance and do odd jobs just to ride my bike to one of the neighborhood hobby shops every few weeks, for a new HO car or parts. Those were the days! Anyway, I really enjoyed your email, and would like to post most of it on my site with your permission. It was very well written, and full of warm memories many people will probably relate to. Regarding the sealed set I have on the site, it's a guaranteed original, taken out of the back room of a bar where several of them were stored since the 60's. Actually this set came with the cars you mentioned in the early 60's (in a variety of car colors), but later they used the same set and put other cars in it as well. This set in various forms was sold as late as '67. Take care, and thanks again for writing...you made my day! Received your reply and highly enjoyed the drive into our pasts. Sorry, about the erroneous info concerning your set. You have my permission to edit, correct, post and use my letter as you see fit. Interestingly, PERRY HIRAMOTO, my schoolmate and best friend since we were five, twice my best man-at least I got something right, my own personal design engineer, a second son to my parents all throughout our lives and an adventuring companion that I have shared, prodded and dragged into all my hobbies, travels, (American river rafting after work - at night...Ops) sports and relationships has repeatedly remarked to me over the last few years how the golden age of our ho scale racing in the 60's was the best times of his life and that he wishes we could just go back to live in that time again. My self-chosen brother is driving up from LA next week to spend his vacation with me. Did I forget to mention that I just purchased a whole roomful of new AFX race sets, and enough extra track sections and extra cars from various manufactures to create a large 6 lane course along with a few high end speciality cars purchased as an early Xmas present for Perry. The first sets arrived today. Any guesses as to what we will be doing next week. Looking thru the rearview mirror.